Canines are not naturally aggressive animals, meaning that aggression is a correctable behavior. We love working on training aggressive dogs because they are so much happier once they are free from this burden. The first thing we need to do in solving your dog’s aggression problem is figure out what the cause is for your dog’s tendency to react aggressively. 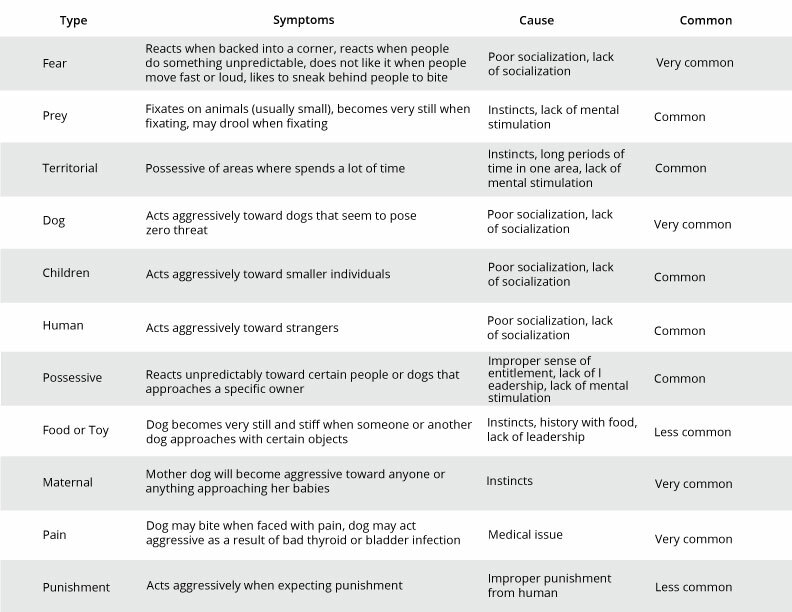 There are several types of aggressive behavior (see chart below), and most aggression is correctable. However, the owners play a big role by heeding our instructions and following the course guidelines in our Cincinnati dog training and dog aggression training classes. Some aggressive behavior, such as “predatory aggression”, cannot be rectified because it is directly related to instincts, but you can still succeed by showing your dog when it is and isn’t appropriate to rely on their instinctual drive. Fear Aggression. Reactions based on fear, typically stemming from improper socialization skills. Predatory Aggression. Typically found when hunting small animals, this aggression can be sourced from an instinctual need to hunt. Dog Aggression. 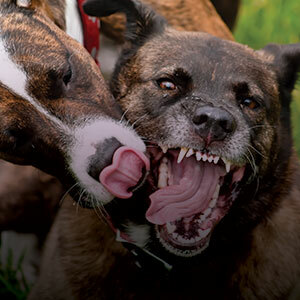 It is common for dogs to become aggressive against other canines that may be viewed as a threat. Child Aggression. Very similar to Fear Aggression, this behavior stems from poor socialization with younger humans. A lot of times, aggression is misdiagnosed, where someone has put an inappropriate label on the situation, such as stating that “my canine hates other dogs” or “my pet definitely hates people with hats on”. Dogs can’t “hate”, or at least that is not why they react. Reasons a dog might react could be possessiveness, fearful, territorial, and some dogs even have a false sense of entitlement. They react simply because they can. This is usually a result of lack of leadership in the dog’s life, so he or she has assigned themselves as the decision maker. Honestly, very few dogs are comfortable doing this, they would much rather be the follower. Often times, dogs will behave aggressively, seemingly for no reason. If your canine is lashing out at other dogs, chances are that they are not acting out due to inherent aggression. This aggression can be due to a lack of social skills and the nervousness of not knowing how to act in a social setting. The Dog Wizard offers optimal dog aggression training to help provide dogs with the proper behavior for how to act in unfamiliar situations. A lack of socialization and many times a negative experience can shape how a dog reacts to others in any setting. Traumatic experiences can be at the center of much of your canine’s aggression problems. If a young puppy is attacked by an older dog, that puppy will remember this experience for the future. You, as a loving owner, shelter your poor dog, keeping him or her safe from further damages. The result, however, can be a nervous dog that expects this sort of negative behavior from other canines in the future. The proper steps need to be taken in order to foster better experiences and increase canine comfort, including socializing your pup with lots of other dogs to enforce that fear responses are not necessary. Introducing better social skills is a vital part of this process. Another area that results in the need for dog aggression training is the consistency of socialization that is given to your dog. Depending on their breed and upbringing, some canines will require more consistent social upkeep to ensure that they are experiencing positive reactions when meeting strangers. Continual efforts are recommended to keep your pup up to speed on how to properly socialize with others. Being comfortable is a major contributor to how your dog will react in strange, stressful situations. The Dog Wizard is here to provide the best obedience training for dogs in Cincinnati. Our experienced, certified professional dog trainers are here to give you the information and tools needed to improve your dog’s behavior and give them the ability to more fully enjoy life. Dogs are not aggressive creatures and often act out of anxiety or fear. Our dog training school can help to diagnose the source of these aggressive behaviors and help to solve them, making you and your furry friend happier in the long run!